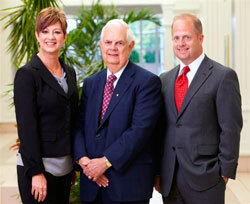 Jim, Miriam and Warren Erickson have a combined 114 years of experience. That includes more than 5,900 weekly Taste Tests. A cow produces 90 glasses of milk a day, and the amount of raw milk AE receives daily weighs more than 1,000 cows. AE makes more than 300 different dairy products including 50 flavor combinations of yogurt. The longest time in development for a new yogurt flavor was 10 years, and the most challenging yogurt flavor was Strawberry Rhubarb Pie. AE has some yogurt flavor firsts including: Blueberry Buckle, Key Lime Pie, Peach Cobbler and Strawberry White Chocolate. If all the egg nog cartons made each year were stacked end to end, they would stretch from Des Moines to Davenport. Each year, the dairy plants more than 30,000 tulip bulbs on the grounds at their Des Moines office. AE was the first dairy to offer double safety-sealed packaging, and also the first to package frozen yogurt for sale in grocery stores. When two young boys in Iowa disappeared in the early 1980’s, AE was the first dairy in the U.S. to put the photos of missing children on milk cartons. As the official AE ambassadors, Annie the cow and Eric her calf are the much loved "icons" that act as greeters in front of the AE Dairy plant in Des Moines. 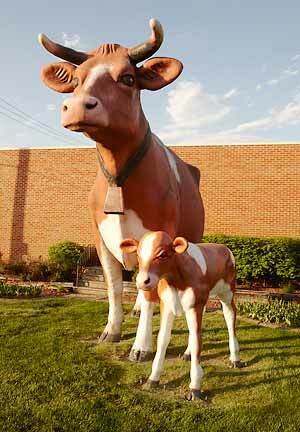 At 14' tall and 2500 pounds of fiberglass, Annie has graced the intersection of Hubbell and University since 1966. Her 5'7" calf Eric has been by her side since 1977. In October 2007, Annie and Eric were involved in a cow caper. AE plant employees were startled by a loud crash and thud at 2:00am. They discovered Eric had been stolen and Annie had a large gash in her leg. Des Moines police quickly found Eric, whose leg had been broken, along with the SUV used in the caper. Local news coverage of the story triggered an outpouring of love and concern from area residents including offers to repair Annie and Eric. With the help of our friends at O’Halloran International, Annie and Eric were restored to full health in time for the holidays.